HMH Books for Young Readers, 9780544668379, 32pp. The note read: Bedtime is canceled. Maggie thought of it. Her brother wrote it. A news reporter read it. This was big news. He reported it. 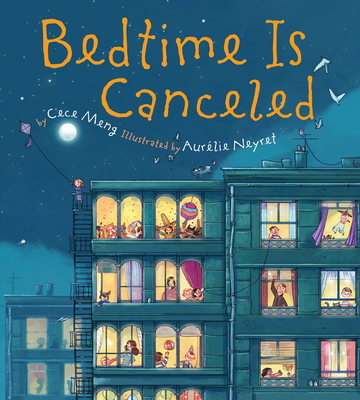 Before they knew it, the whole city discovered that bedtime had officially been canceled, so no one went to sleep! Cece Meng, author of I WILL NOT READ THIS BOOK and TOUGH CHICKS, delivers a pitch perfect cautionary tale, a wry parody of our information-glutted age, and heart-warming brother & sister adventure. Illustrated with wit and whimsy by French artist, Aurélie Neyret. Aurélie Neyret is an artist and illustrator living in Rhône, France. She has worked for several European publishers, such as Editions Sed, Bayard Jeunesse, and Petit à Petit on projects ranging from children books or magazines, to more mature projects including trading cards illustrations for video game giant SquareEnix. "A few reads of this ought to tire out kids before their not-canceled-after-all bedtimes." "Meng playfully expands and exaggerates children's efforts to put off the inevitable lights-out and turns a universal tug of war into a hilarious tour de force." "Meng's writing is clear, direct, and funny, and Neyret's digitally created illustrations have an appropriately comic and cartoonish tone."